As if the Arrowverse couldn't get cooler or more DC Comics character-filled. 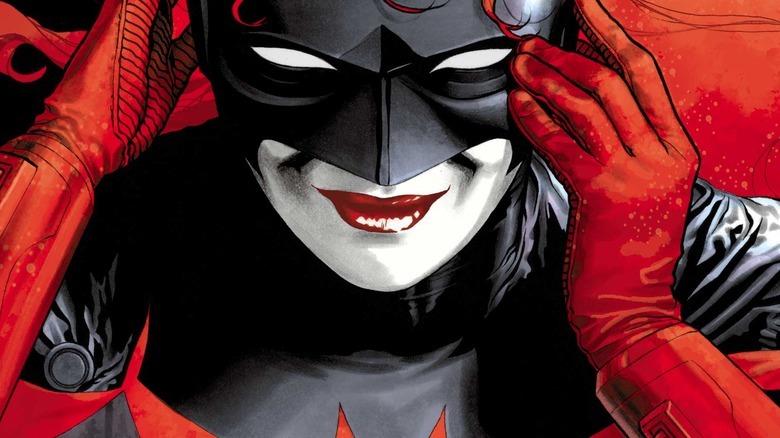 In the first-ever time the winged heroine appears on a screen of any kind, Batwoman will be introduced to the CW's Arrowverse in the television universe's next crossover event. Network president Mark Pedowitz and Arrow actor Stephen Amell, who plays the titular bow-baring hero, broke the exciting news during the CW's upfront presentation on Thursday. "We're incredibly excited to announce that we'll be doing another crossover event this fall on the CW, and we'll be introducing a new character," Amell stated (via Entertainment Weekly). "For the very first time appearing, we'll be fighting alongside Batwoman, which is terrific. The crossover is going to make it to air in December. I need to leave right now and start filming it." Pedowitz chimed in after Amell's giddy words, revealing that the upcoming crossover will also introduce Gotham City — an expected extension given Batwoman's backstory. The heroine, who was first introduced as Kathy Kane in the July 1956 DC Comics issue Detective Comics #233, is one of a number of powerful vigilantes that keep a watchful eye over the city that houses Arkham Asylum, Blackgate Penitentiary, Iceberg Lounge, Wayne Enterprises, and Wayne Manor. When DC Comics released its New 52 comics, Batwoman got the reimagining treatment; she's now known as Kate Kane, and is a Jewish lesbian with romantic connections to Maggie Sawyer (who's actually played by Floriana Lima on Arrow). "We are adding the city of Gotham into the Arrowverse. This will be another full-throttled, action-packed event," Pedowitz promised. Details like a character description for the CW's take on Batwoman or the actress who will play her weren't immediately available, but rest assured that we'll update you as soon as the information surfaces.